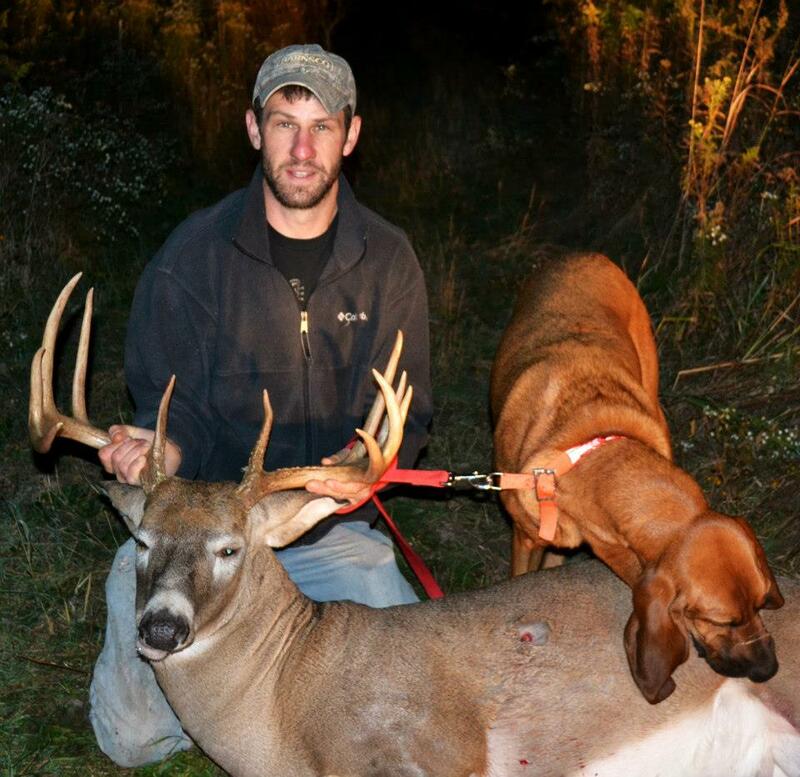 This Oakland County Monster was taken October 19, 2012. I was worried at first on whether or not we would make this recovery, The hunter was still out looking with a friend , I met a family member of his and he led me to the start of the track, It was raining very steadily. He showed me first blood pointed me in the direction and off Cash went, there was a very heavy blood trail and it was very easy for Cash, the whole time the gentleman kept saying to me "I have never seen anything like this" as Cash zipped down the trail turn for turn, within 5 to 7 minutes we had traveled 300 to 400 yards and saw flashlights from the hunter and his friend ahead, I shouted out "dog coming, don't pet him". They quickly stepped aside from where they were looking for more blood, and Cash paid absolutely no attention to them and kept on working. right by them made a turn than blood, blood , blood, off we went heading in the right direction, There were several paper plate size blood spots through the track, and steady quarter sized drops. We worked several hundred more yards very easily until we got into some tall grasses than the blood got sparse and disappeared as we hit the open field. Cash went several hundred yards and I just couldn't help but doubt him being that we had such a good blood trail for more than 800 yards. So I stopped him and took him back to the last blood, we sat him down, at this point the hunters family member and friend decided they did not want to follow anymore. The hunter and I continued the search. I restarted Cash and off he went again, down the same exact line, at this point I knew I had to trust him, we worked right by where I had stopped him and in to another field, all the way across that field still not seeing any blood. I got to the other side of this field and began to fill with doubt again. as we reached the field edge, I stopped Cash again, and instucted the hunter to look for any signs of blood on the grass and leaves ahead in the woods. 400 yards with no blood sign at all. He and I began to look and at the same time we both said "I got BLOOD here" what a relief to know that my dog was dead on track!!! of we went again Over the fields and through the woods to Monster BUCK we go. It was steady blood the whole rest of the way to this buck. as we came up the hill i saw a set of eyes, but they did not look like deer eyes so I ignored it and kept tracking, shortly after we reached a spot where it looked like his deer had stumbled, and we started down a hill, i looked up and saw the eyes again just ahead about 40 yards away in the brush. I stopped immediately and turned cash around so he would not see the deer, I spotted the deer with my light and saw he still had his head up, but was certainly not getting up. I than decided it would be best to back out and retrieve the hunters bow. 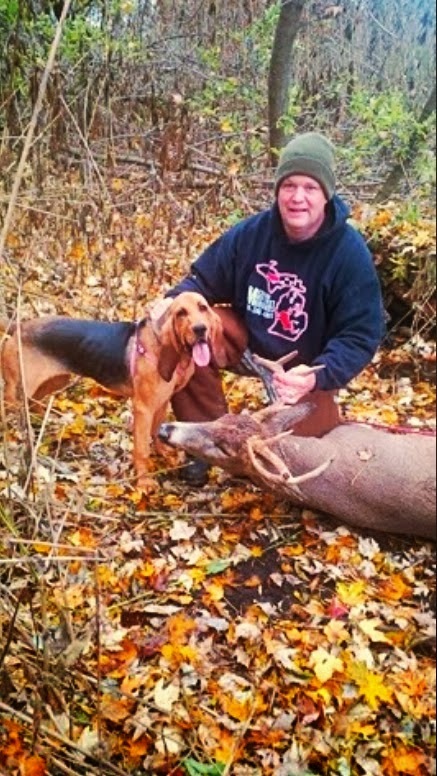 But as luck would have it, by the time we returned this Oakland County Buck had expired. It was green scored at 164. Pouring Rain and Soaking wet, Total length of the track was 1.8 miles it was hit just behind the liver in the middle height of the deer and exited out the bottom. 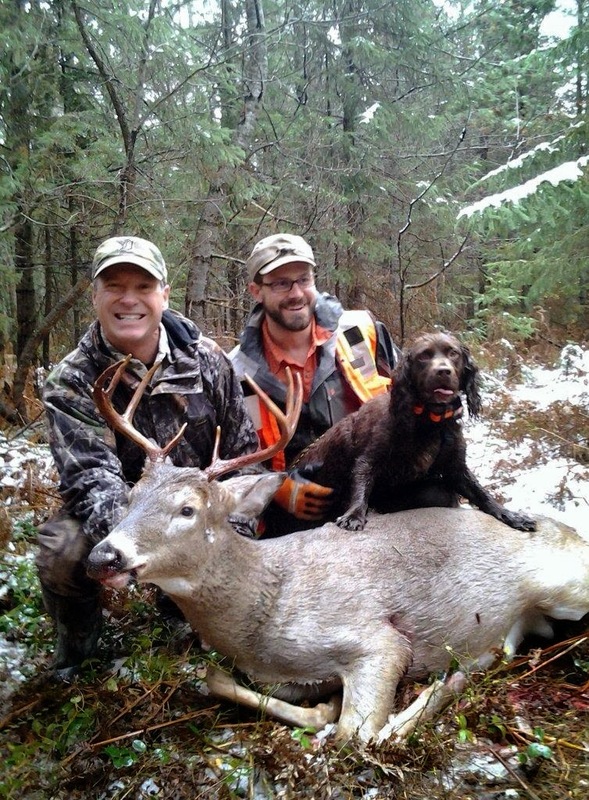 This deer would have been very very difficult to recover without the use of a tracking dog. The trail could have probably been followed a very long way however with the several hundred yard break in the blood, it would have been near impossible to search this large farm for the next spec to get going in the right direction. Congratulations to the Hunter on his 2012 GIANT!! !